Mianzhu Hansen`s Chemical Co., LTD was established in 2003. It is located in Mianzhu Xinshi Industry zone which is about 40 kilometers from Chengdu (the capital city of Sichuan Province). The company`s total assets amount to 270 million RMB. 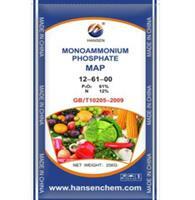 Hansen`s Chemical specializes in producing the finest phosphate products and our “Hansen” brand annual products include 100,000 tons of monoammonium phosphate (MAP), 120,000 tons of phosphatic fertilizer and 200,000 tons of vitriol. The product quality and customer satisfaction are the primary operating purposes of our company. In addition, Hansen`s Chemical also attaches great importance to the coexistence of global environment and human beings, to the coordination of environmental protection and resource development.